This cheesy lasagna recipe is super simple to make; it’s sure to leave your family feeling full and happy. 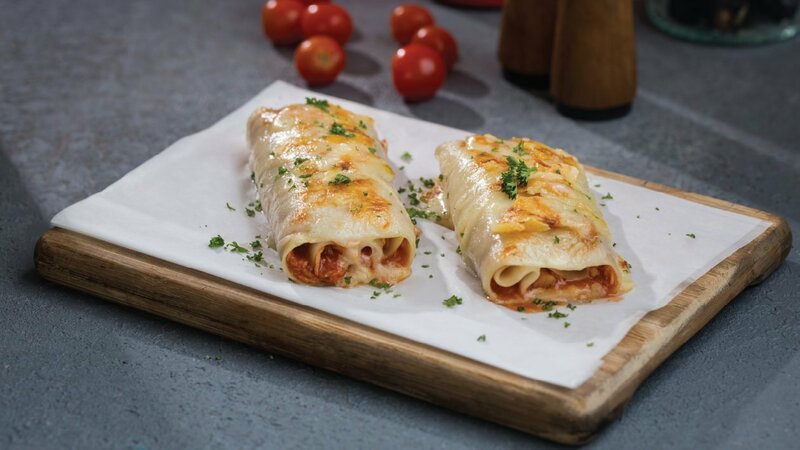 So, go on and take a break from traditional layered lasagna and give these fun lasagna roll ups a try! Fry onion and garlic in oil for 5 minutes until soft, add minced chicken and cook until it changes color. Add the mushrooms, Knorr Italian Sauce, Knorr Chicken Stock Cubes, basil, oregano, salt, pepper and red chillies and cook for 5 minutes. Melt butter in a saucepan, then add flour and cook for 2 minutes. Remove from heat add milk, little by little and stir to remove any lumps. Put back on heat, add seasonings and stir until thick. Add cheese and remove from heat. Spread a thin layer of white sauce on the bottom of the baking dish. Spread a layer of meat mixture on pasta sheet and roll it up. Place the roll ups in the baking dish, top it with remaining white sauce and cheddar cheese. Bake in a moderately hot oven (200*C) until golden brown.